For 500 children from Mbekweni in the Western Cape, walking to school has never been such a pleasure. For many of them, it’s the first time they’re wearing shoes. The primary school learners, aged between 5-12, were the latest beneficiaries of Samaritan’s Feet’s Shoes of Hope project, which has distributed 12 000 pairs of shoes to children in the Western Cape in the past two years. The latest donation was thanks to insurance company King Price, which funded the cost of the shoes as part of its ongoing purpose to make a difference in the lives of ordinary South Africans. The shoes were presented to their proud new owners in a simple ceremony, where volunteers welcomed the children, shared the Samaritan’s Feet story of hope, washed their feet, and provided them with their new shoes. “We’re not just giving these children a pair of shoes: we’re giving them self-esteem, helping them get to school, and hopefully encouraging them to get an education and to create a future for themselves. 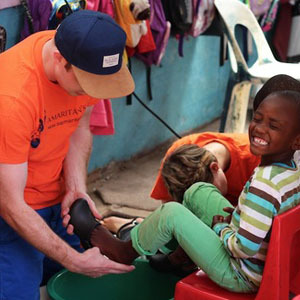 One pair of shoes can bring hope in a hopeless world,” said King Price’s De Wet van Deventer. 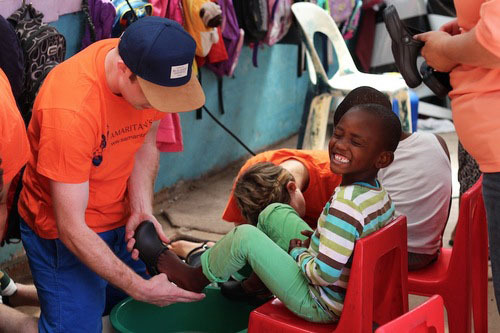 Willem Erwee of Samaritan’s Feet said the Shoes of Hope initiative aimed to bring a life-changing message of hope, love, and compassion to each person they give shoes to.